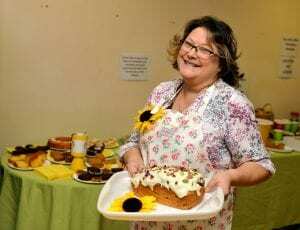 Our first Great Hospice Cake-Off has proved to be a sweet success as local businesses, groups and individuals competed to create tasty treats to sell to friends and colleagues. We were so impressed by the standard of the cakes. On Thursday 13th September our team, like many others across West Cumbria, hosted a cake-off and sale at Workington Community Hospital. The competition was tough and there were plenty of takers for the delicious homemade bakes on sale and those donated by local businesses. 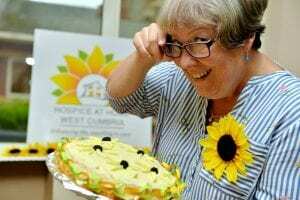 Head judge Linda Hewitt casts her eye over another delicious offering. Sam Davis cooked up an amazing courgette, lime and pistachio cake. UPDATE: We want to say a huge thank you to all the businesses and individuals who took part and have helped us to raise over £6,200!